This is the first case of CWD found in Sublette County, home to 13 elk feedgrounds. This makes twenty-one of twenty-three Wyoming counties with deer or elk with CWD. Only Teton and Uinta counties have not yet found animals infected with CWD. An updated map created by the Sierra Club Wyoming Chapter and Wyoming Wildlife Advocates shows hunt areas where CWD has so far been detected. If only one infected animal is found in a hunt area, that area becomes part of the “endemic zone.” The map shows that over the past 2 years the CWD endemic area in Wyoming is expanding by 3.3 million acres per year, and is spreading inexorably in all directions. With CWD moving ever closer to feedgrounds in western Wyoming, Wyoming Wildlife Advocates and the Sierra Club urge the state to begin phasing out winter feeding of elk to prevent the rapid spread of disease among elk densely concentrated on feed lines for months each winter. “It is incumbent upon state officials, as well as managers of the National Elk Refuge in Jackson, to implement a realistic plan to phase out artificial winter feeding now,” WWA Executive Director Roger Hayden said. “Once CWD reaches feedgrounds we likely will have a more serious problem on our hands. We need to act now,” Hayden said. While CWD is most prevalent in deer, the disease infects elk and moose as well and is contagious among the species. Wildlife experts also recommend conserving predators in order to mitigate the effects of diseases like CWD. Wolves, bears, mountain lions and coyotes attending herds of deer and elk can remove sick individuals. “Not artificially feeding and concentrating deer and elk, spreading them out naturally across the landscape, and conserving abundant predators are the best tools we have to ensure the health of our wildlife for the future,” said Lloyd Dorsey, Conservation Director for Sierra Club Wyoming Chapter. 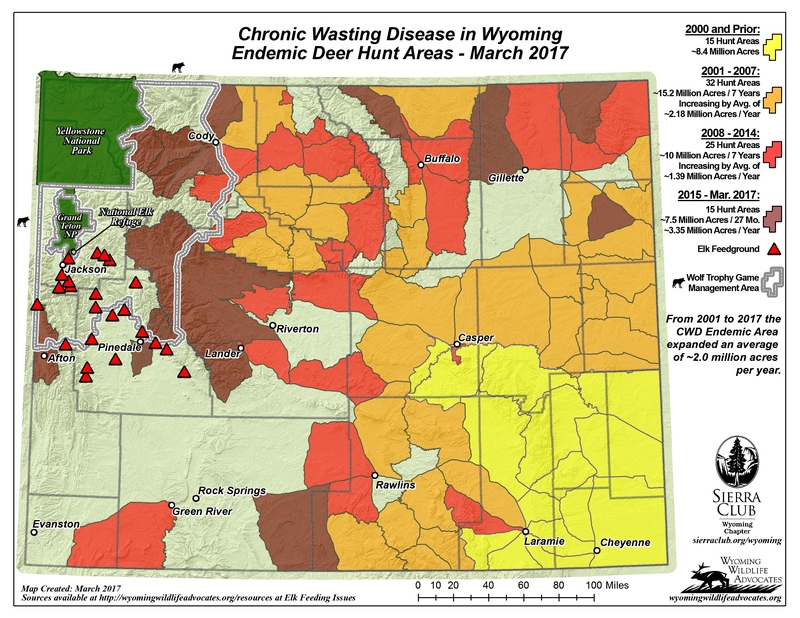 Chronic Wasting Disease in Wyoming -March 2017 courtesy Wyoming Wildlife Advocates and Sierra Club, Wyoming Chapter. Technical Abstract: Aims: Chronic wasting disease (CWD) is a naturally-occurring, fatal neurodegenerative disease of cervids. We previously demonstrated that disease-associated prion protein (PrPSc) can be detected in the brain and retina from pigs challenged intracranially or orally with the CWD agent. In that study, neurological signs consistent with prion disease were observed only in one pig: an intracranially challenged pig that was euthanized at 64 months post-challenge. The purpose of this study was to use an antigen-capture immunoassay (EIA) and real-time quaking-induced conversion (QuIC) to determine whether PrPSc is present in lymphoid tissues from pigs challenged with the CWD agent. Methods: At two months of age, crossbred pigs were challenged by the intracranial route (n=20), oral route (n=19), or were left unchallenged (n=9). At approximately 6 months of age, the time at which commercial pigs reach market weight, half of the pigs in each group were culled (6 month challenge groups) were allowed to incubate for up to 73 months post challenge (mpc). The retropharyngeal lymph node (RPLN) was screened for the presence of PrPSc by EIA and immunohistochemistry (IHC). The RPLN, palatine tonsil, and mesenteric lymph node (MLN) from 6-7 pigs per challenge group were also tested using EIA and QuIC. Results: PrPSc was not detected by EIA and IHC in any RPLNs. All tonsils and MLNs were negative by IHC, though the MLN from one pig in the oral <6 month group was positive by EIA. PrPSc was detected by QuIC in at least one of the lymphoid tissues examined in 5/6 pigs in the intracranial 6 months group, 5/6 pigs in the oral 6 months group. Overall, the MLN was positive in 14/19 (74%) of samples examined, the RPLN in 8/18 (44%), and the tonsil in 10/25 (40%). Our records show that while some use is made of porcine materials in medicinal products, the only products which would appear to be in a hypothetically ”higher risk” area are the adrenocorticotrophic hormone for which the source material comes from outside the United Kingdom, namely America China Sweden France and Germany. The products are manufactured by Ferring and Armour. A further product, ”Zenoderm Corium implant” manufactured by Ethicon, makes use of porcine skin – which is not considered to be a ”high risk” tissue, but one of its uses is described in the data sheet as ”in dural replacement”. This product is sourced from the United Kingdom….. Thank you for the links Terry. I know from your previous posts on TWN, you are deeply involved in trying to wake folks up about CWD. There seems to be a “the lights are on but nobody’s home” mentality these days, when it comes to addressing the dangers and that scares the crap out of me.